Email marketing is regarded as one of the most profitable forms of content marketing, but how do you get users engaged? Once of the most effective ways of making an impact with a user is by appealing to them emotionally. It’s easy to forget, especially in business to business marketing, that regardless of the platform, you’re engaging with people. Yes, you may be selling to a company, but there’s a person behind that buying process and they’re who you need to appeal to. 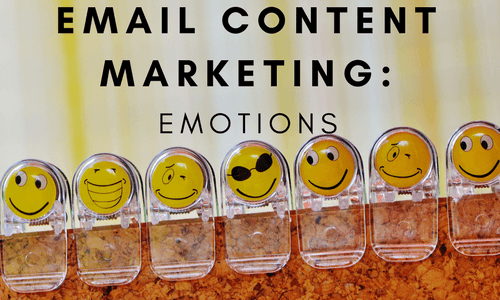 Working emotion into your email content marketing could be the solution to your connection problem. Here’s how it’s done. According to a study done by the Advertising Research Foundation, or the ARF, a company’s likeability is the number one factor that influences an advertisements success. That being said, your company need to be endearing to your customer base. If your consumer base is socially conscious environmentalist, you need to ensure that your company follows suit. Use biodegradable packaging, donate to charities that protect the environment, and be sure to feature each of these aspects in your marketing and email campaigns. Like we said above, you’re selling to people. Regardless of the industry, a person is on the receiving end of your email campaign. Buying from a person is much more appealing than buying from a computer. To ensure that your company has a distinct personality, you need to define your brand. Make sure your brand has a specific voice and personality that you bring out in each piece of marketing. From your newsletter to your paid traffic campaigns, your brand should feel consistent, unique and most of all, human. Remain professional, but don’t be afraid to have a personality. In the modern day of inbound marketing, consumers don’t want to feel like they’re being sold to. A great way to circumvent that “selling” mentality is to tell a story. Instead of trying to sell the customer on the idea that your company is established in the industry, tell them the story of your company. How was your business established? What hardships have you faced? How have you overcome them? By creating a narrative, you’re still conveying the information, but you’re doing it in an entertaining way that plays on the user’s emotions. Form your email content marketing around storytelling, rather than sales pitches and notice the change in your customer’s responses. This is one of the first lessons a marketer learns. For a user to purchase you product, they have to need it. But you may over look how important emotional appeal is to creating a need. The user may not actually need your specialty coffee beans, but you can make them feel like they do. The top emotions you can play off of to create a sense of urgency with your users are: hope, guilt, vanity, belonging, lust, greed and fear. If the user thinks your coffee beans are making a difference in the world or that everyone else is drinking them, you immediately convince them they need your coffee beans. If creating a need doesn’t influence your user, bribery is always another option. But once again, the persuasion can’t be a blatant sales pitch. You have to make it personal. When using persuasion in your email content marketing, make sure you’re utilizing the information you have on the customer. Send them coupons that directly relate to their buying patterns. Send them a 20% off code to use on their birthday. Ask them to review their customer service experience to receive a special code. Each of these persuasion techniques relate to the user personally. They make the customer feel valued and heard, but they also help you bring in sales. A user relies on their emotions to drive their purchase patterns. Whether they acknowledge it or not, emotions drive a consumers behavior. Email gives you a unique opportunity to connect with the user emotionally. With these tips you’re off to marketing success. Be sure you’re making it into the user’s inbox by using our email verification service.